January. A new year. Everyone is all excited about kicking goodbye the dumpster fire year of 2016. But are we actually excited to welcome 2017? It is now the month and year that we will inaugurate … that guy. I can’t seem to remember his name. No matter what your political leanings are, you can certainly understand that any mother of a Black boy will be saddened to see President Obama leave the Oval Office. My son has had a racial mirror in the President of the United States of America for his entire life. I absolutely cannot stress to you how important that has been for our family, and probably for millions of other families. I am overcome with emotion. Today was haircut day for my oldest son. For certain sensory reasons, it’s not easy for him. He says he is not ready for a barbershop, so, as always, my husband was cutting our son’s hair in the upstairs bathroom. 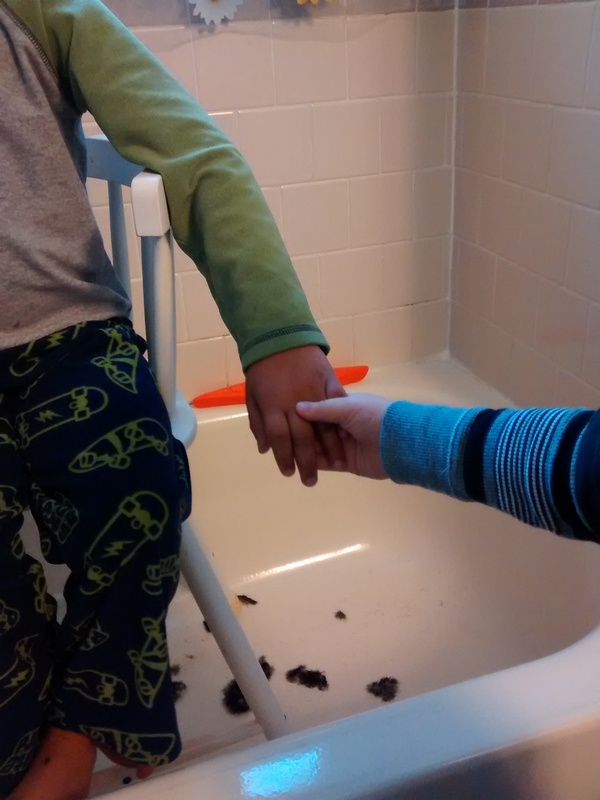 I thought my twins were playing in their room, but as I reached the top of the stairs, I saw Twin A perched on the toilet lid, holding my oldest’s hand. He was offering his hand of comfort to his distressed brother. No one asked him to do that. A fat little four-year-old white hand holding the shaky brown hand of his six-year-old brother. My heart melted. 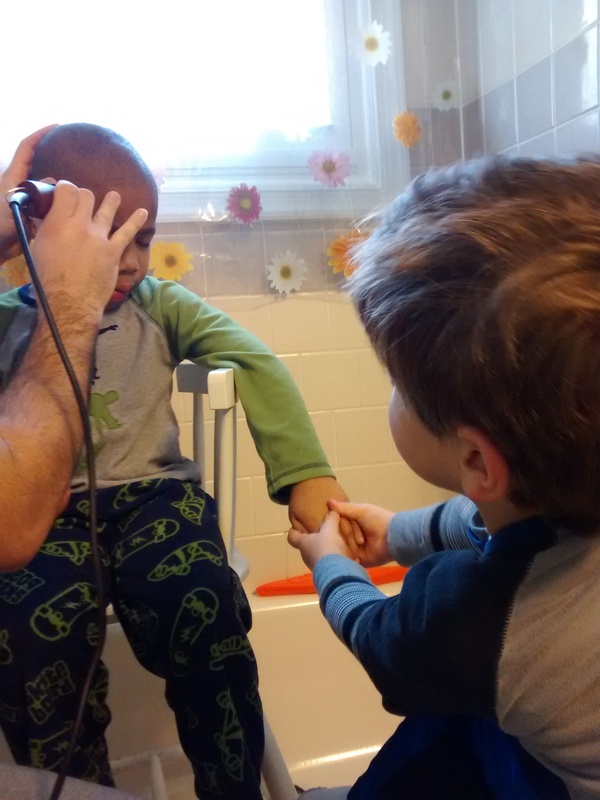 The steady hand of his brother calmed my son, and the rest of the haircut went smoothly. They sat like that for about ten minutes, no one saying a word as the clippers buzzed. There is a now-iconic image of a five-year-old Black boy touching President Obama’s hair in the Oval Office. Have you seen it? President Obama, the leader of the free world, is leaning over to let the boy touch his hair. I don’t know if the significance of this image can truly cross the racial parenting divide. I am no expert in Black hair, not by any means, but as the mother of a little boy who looks like the one in the picture, I weep every time I see it. Even if you are staunchly anti-Obama, can you see how important this image is to us? Can you walk with me for a moment and feel this? More importantly, can you walk with my son, who sees only white faces in his very own home? Can you imagine what it’s like to be him – or any other Black boy in America whose ancestors were probably slaves – and know that the most powerful man in the world has hair that feels exactly like his? For eight years we’ve been able to hold up that mirror to our boys: The President of the United States of America looks like you. And now, in this new year that is supposed to be new and fresh and better, we get to hold up … a man who… not only doesn’t look like our boys, but … nevermind. I can’t. It was not just hair. It was hope. *Source: Calmes, Jackie. “When a Boy Found a Familiar Feel in a Pat of the Head of State.” New York Times. 23 May 2012. Accessed via Web 2 January 2017. And the Washington Post says it better than I can: Photo Speaks Volumes About Obama and Race. I really love the strong will and desire you have to provide your children with adequate support, strength, and protection. It is truly beautiful. I hope that you can find it in your heart and conscience to research and protect your sons from the historical racism of the Church. Of course, I had the misfortune of being raised in the church prior to the recent Essays and official dissociation from the racist past of the church – but my parents defended the words of the Prophets… the Church, with the support of my parents, insidiously ingrained in me that I was less righteous in the pre-existence. That I was descended of Cain. That I was never to marry outside of my race lest my children be an abomination. That my ancestors would never be granted the priesthood and never attain Celestial Glory in the sense that my white family members could. Please know that your children are growing and learning in a world which now gives them ready access to history, and that being raised in the Church will present them with endless encounters with nonmembers who will challenge them to learn their church’s history. Please be ready to stand beside them and tell them that the former leaders of the Church were wrong. That Brigham Young made very poor choices and said things that were very simply untrue. Please do not for one moment allow your children to think that you support the terrible statements and actions of early Church leaders – because when the time comes, when they discover that history and come to you, the choice to be dismissive or apologetic regarding that history will crush something inside of them that you can never repair. Strength and love. Peace and joy. Thank you for your perspective. Your lived experience is valuable. My husband and I have been very interested in learning more about early church history. We enjoy reading all that we can about that topic. My husband has become somewhat of an expert in this field, for which I am very grateful! We definitely have my son and his well-being in mind when we learn about this stuff. I am a descendant of Brigham Young. One of the most interesting facts we have learned is that Blacks did actually hold the priesthood in the earliest days of the church, under Joseph Smith! We love learning about this, and will always keep our son’s best interest in mind.